2016 John Deere 803MH Processor with a Waratah 623C Head. Hour meter reads 2,834 hours, runs and starts good, pre-heat system, 3 year - 5,000 hour warranty, strong hydraulics and drive system, tight boom and head, new knives under JD recall, 28" double grouser pads and rails have 800 hours on them, Extreme duty rails, head is in good working order, TimbeRite measuring systems, heat, A/C, lights, & radio. Contact Aaron @ Red Pine Equipment 218-720-0933. Machine is located in Northcentral USA. 2015 John Deere 803MH Processor with a Waratah 623C Head. This machine starts & runs good, 4,603 hours on meter, engine and hydraulic pre-heater, cooler debris guard, 5 year JD Link telematics, 30" double grouser pads with slides, undercarriage is @ 50%. Lap seat belt & air ride, standard counterweight, LED work lights, 6.13M boom, premium radio, rear pull down shade, & toolbox. Waratah 632C Head has auto tensioning, 3/4 chain, tilt and 360 rotation. Contact Aaron @ Red Pine Equipment 218-720-0933. Machine is located in Northcentral USA. 2016 TimberPro TN725-C Processor with a Log Max 7000 Head. This machine has 2,700 hours as of August 30, 2018, Cummins QSC 8.3 - 300 HP engine, Caterpillar D6 size track frames with double-flanged rollers, 24" pads, 6' squirt boom, Lohmann final drives, Rexroth 2-speed motors. 2004 Log Max 7000 has had saw and feed wheel motors replaced, valve bank resealed, new knives, all cylinders repacked. Logmate 400 computer system. Carrier has fire suppression system, Espar pre-heater, deluxe air-ride seat with heat and lumbar support, heat, A/C, and LED lighting. Owner/Operator machine. Contact Aaron @ Red Pine Equipment 218-720-0933. Machine is located in Northcentral USA. 2014 CAT 501HD Processor with a Fabtek 4 Roller Head. Hour meter reads 3,780 hours, runs and starts good, strong hydraulics and cylinders, undercarriage is @ 80%, 24" single grouser pads, Pro heat system, tight boom, heat has independent 3 wheel measuring, grab arms and feed roller are all in good order, drive system is in good working condition, clean machine & well maintained, saw has auto grease system, heat, A/C, lights, and radio. Contact Aaron @ Red Pine Equipment 218-720-0933. Machine is located in Northcentral USA. 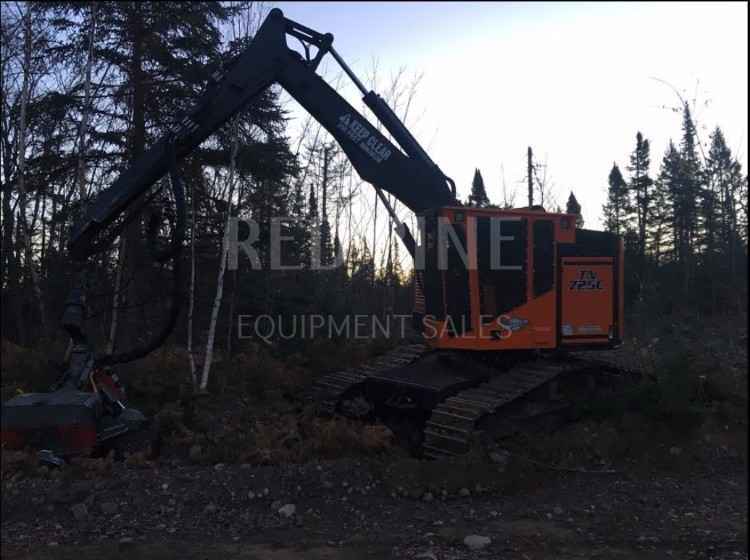 2014 TimberPro TL735-B Processor with Logmax 7000XT Fixed Head. This machine has a Cummins tier 3 300 HP engine, runs and starts good. 8,100 hours. New injectors, oil pan gasket, and rear engine seal. Pumps resealed and checked. Espar heat engine and hydraulics. Pump drive new input shaft and bearings. All regular maintenance done on schedule, oils changed every 1,000 hours, engine oil every 500 hours. Undercarriage is @ 50%, 24" double grouser pads. Processor head is stronger and more productive than other fixed heads. New Logmate 500 computer and head module. $40,000 in recent updates and work done on machine. New roto bearing on head, new saw motor, new saw bar holder, auto level option, new leveling cylinders, new A/C pump. Contact Aaron @ Red Pine Equipment 218-720-0933. Equipment is located in Northcentral USA. 2012 EcoLog 590D, serial # ELD0590D00000432 with LogMax 7000C, serial #170016. 6395 hours, in good condition. Comes with sunshades, Webasto preheater and fire suppression system. This is a great deal on a late model well cared for harvester! Please contact Ron 1-715-490-2638 with any questions.